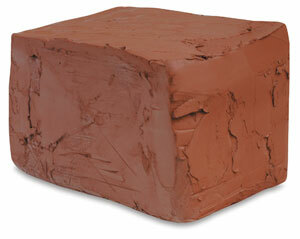 Amaco Sedona Red Clay has a rich red color before and after firing. It's excellent for all hand methods, including modeling, slab, coil, sculpture, and wheel throwing. This clay has wide firing range of Cone 05–02 (1911°F–2052°F). At Cone 04, shrinkage is 11.7% and absorption is 7%. At Cone 02, shrinkage is 13% and absorption is 9.2%. Sedona Red Clay fires well without slumping. Each 50 lb (23 kg) carton contains two 25 lb (11 kg) bags of moist clay.